I'm not a big fan of Los Angeles but Anaheim turned out better than expected. The weather was great, there was a lot to do and the traffic wasn't as bad as I expected. The traffic nightmare was much worse in Austin, TX! The main reason for our stop was a mandatory visit to Disneyland. 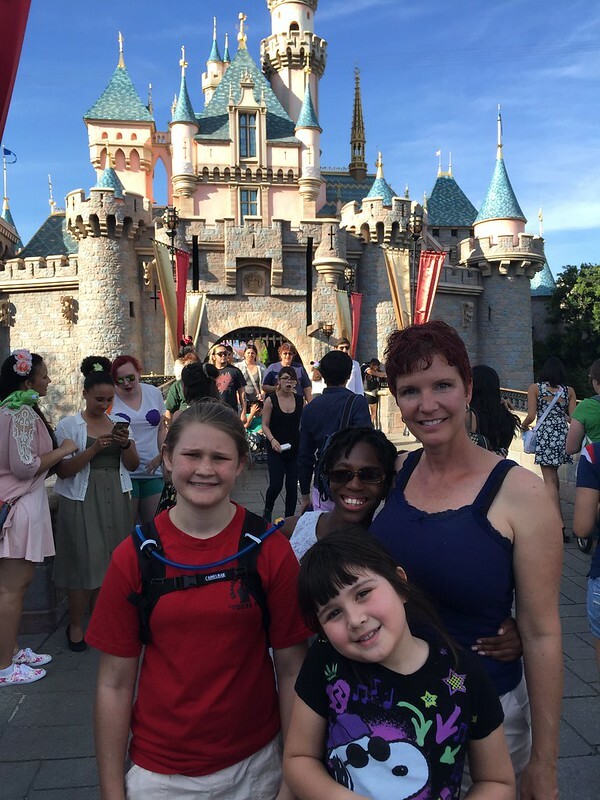 Since we've been Disneyworld pass holders for years, the girls have been looking forward to seeing how the park was in California. Kira had been researching the park on Youtube and already knew which rides were there and which ones she wanted to do. We also had a chance to catch up with our Brother-in-Law, Heinz, who had recently moved to the area. It was dark and late when we pulled into our RV spot Wednesday night and we were tired from the 5 hour drive from Vegas. This was our first stop with our new 41' fifthwheel and the RV park was smaller than we'd hoped. It was a little tricky pulling into our spot on the end but I got it somewhat straight and we called it a night. We'd unhook in the morning. Thursday was work and school as usual with one significant event. We dropped the RV on our new truck. Since this fifthwheel RV thing was new to us, we didn't know that it's advisable to have the truck pretty much pointing straight to hook up and unhook. The previous night I'd left it at a good 30 degree angle cause.. hell I didn't know any better! We had a hard time getting the RV unhooked due to the angle and after trying to slightly move it, unhook it, hook it back up to move it, whatever we could do to get it off, the kingpin slid off the fifthwheel and the 15,000 lbs RV crashed down on our tailgate. It only dented it slightly (it's "Ram Tough!!") but finally the stupid thing was off. Again, this was our first time but we were already dreading hooking up and trying to exit the park at the end of our stay. I was hoping we could make the turn to get out. I think Cathy went back into the RV and did some shots before helping the girls out with school. After work we headed to a local RV dealer for some supplies and to have them take a look at the fifthwheel; it was slight cockeyed. Fortunately, they fixed it the 'Merican way with a piece of wood and a really big hammer! Then we headed down to Newport Beach for a dinner of appetizers at the Newport Beach Brewing Company. Afterwards we stopped by Fry's to do a little electronics browsing which was awesome! Not a bad way to finish off a crappy day. 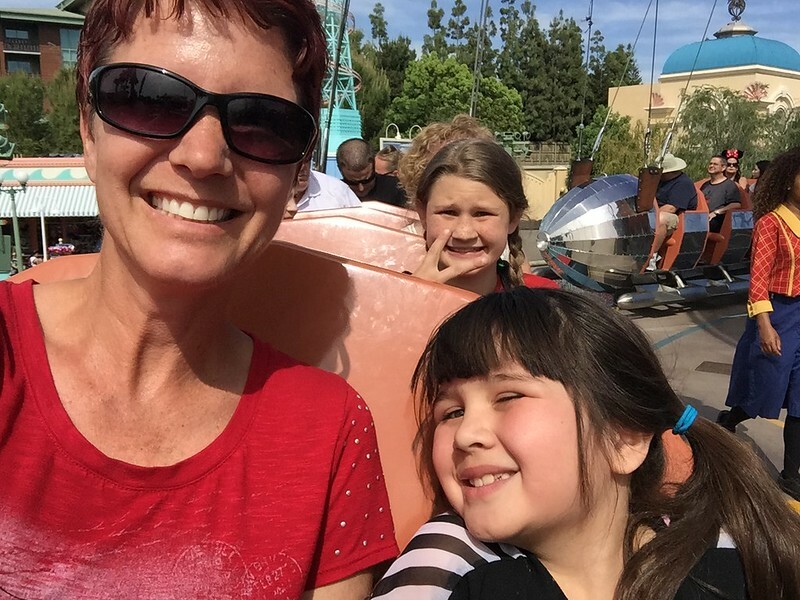 Since we knew we were going to be doing a lot of park hopping, Cathy purchased a 4 day CitiPass pass to Universal Studios, Disneyland and Disney California Adventure (it's sister park next door). After work and school we decided to drive the 5 minutes down to road to do Disneyland for awhile. For some reason we tried to ride all of the rides that make Lexi cry. 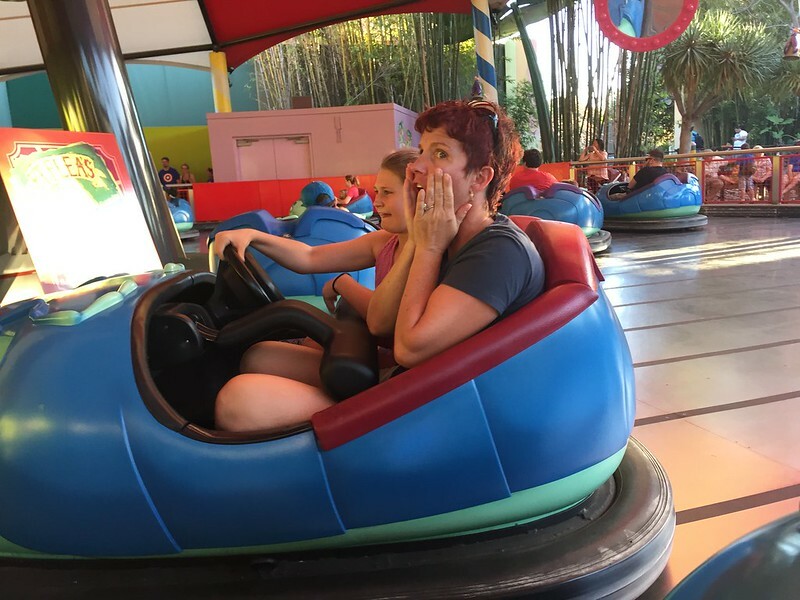 She always freaks out while in line and then loves the ride once done. This of course makes Cathy insane. 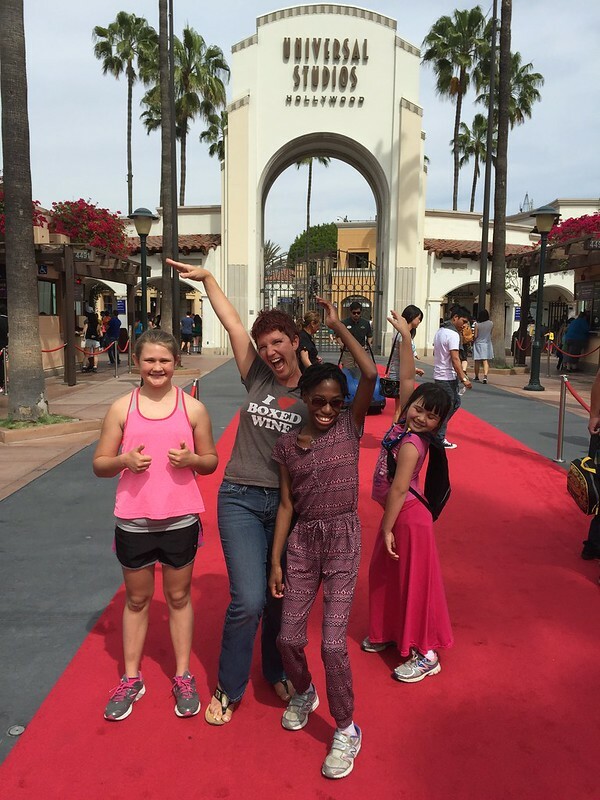 We rode the Tower of Terror, California Screamin roller coaster and the Crazy Ferris Wheel, which was a blast!!! We also watched a little Frozen theatre show (super funny) and the "Broadway" production of Aladdin which the girls absolutely loved!! We left at closing time, stopped by Taco Bell on the way home and then hit the sack. We were going to Disneyland again in the morning! I needed my beauty sleep. Saturday we set off for Disneyland after lunch. After a couple of hours of waiting in lines (they don't offer guest assistance passes), riding the lame rides and standing up while watching Fantasmic, we realized that Disneyland completely blows in comparison to Disneyworld. We'll never go there again. On Sunday we decided to get out of the "Disneyland area" and head north of Hollywood to Universal Studios. Even though a couple of the key attractions were closed/broken, we did get a guest assistance pass and had an awesome day. So much better than Disneyland! I especially enjoyed the Backlot Tour where they take you through all of the actual TV and movies sets that are in production. Extremely interesting. 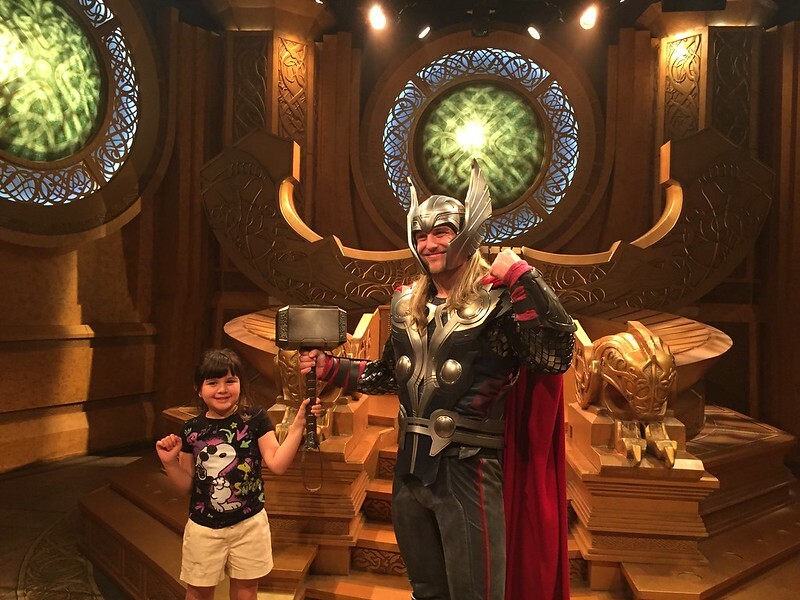 We did this "Thor" tour and Lexi was selected to help pick up Thor's hammer so she got to take part in the show and we had some special photos taken just for us! The video is really cute! The high point in the day for Cathy was when we sent the girls on a couple of rides by themselves and we ate Chinese! Cathy had been craving Chinese food and made everyone eat dinner at Panda Express. The girls were not happy. Monday I worked all day while Cathy took the girls to Disney California Adventure right after it opened (I was done with theme parks). 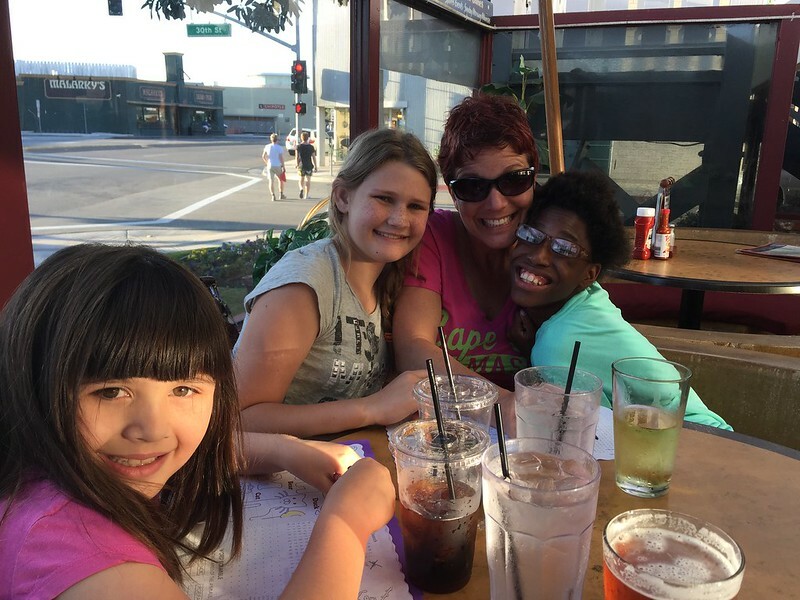 After work I picked them up and we headed back to the Newport Beach Brewing Company to meet Heinz for a late dinner. It was such a great time catching up with him and he follow us home so we could talk some more and show off our new palace to him. He ended up leaving very late and we (mostly Cathy) went to bed exhausted. Tuesday we were heading north so Cathy ran some errands in the morning and we hooked up around noon. However, we ran into our next issue when trying to hook up the RV. For some reason the front jacks wouldn't retract. I check around for awhile and then we finally called the La Mesa and talked to the guy that did our walk-through. He helped me find the fuse for the jacks (talk about hidden!!) and luckily I'd purchased a number of fuses before we left Florida and one happened to be the one we needed! The RV spots in front of us had magically cleared out so it was a breeze leaving the park and heading north to San Luis Obispo.